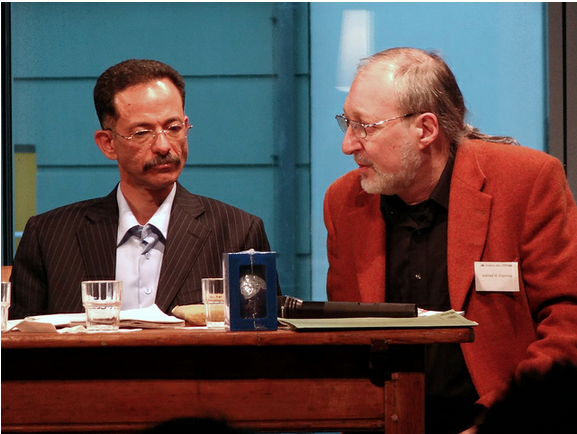 The renowned Yemeni novelist, Ali al-Muqri was a guest speaker at Heinrich-Böll Stiftung (A German Foundation catering of green political movement worldwide) in berlin, Germany, last 7th June, where he spoke about a range of issues related to politics and culture of Yemen. The seminar started by al-Muqri reading an extract from his winning novel of the top award of the International Prize for Arabic Fiction "The Handsome Jew" and he briefly spoke about what writing means to him and to what extent it is related to freedom. Afterwards, he openly expressed his interesting view on the Yemeni political activist and Nobel Peace Prize Laureate 2011, Tawakkol Karamn. "I lament her absence from her political activism. Currently, she is only flying around the world and meeting presidents and ambassaders but she should have continued her struggle on the ground," al-Muqri says.. "Over all, I think, the Nobel Peace prize was truly intended to be given to all women who tried to librate themselves and call for political liberty. I must say that I feel really sorry for how women were strained afterwards by islamists and anti-revolution people," adds al-Muqri. He says that over the past 5 decades, Arabs have produced the most inspiring song or poem that is, "The people want the downfall of the regim." "We were oppressed and had not even the least right of freedom of expression, now we are in the process to gain that right," he says. He says that he can't predict how things would be around the region in the future but he stresses on the mechanism of the post-revolution process. "I believe that it's very important to dismantle the system/regime and not only topple the regime. Without dismantling the previous regime that exists at throughout the whole country; from the east till the west, the north till the south, there will no be any benefit from just toppling the regime," explains al-Muqri. 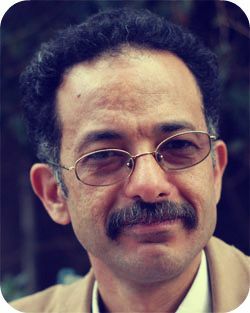 When al-Muqri is asked about the literature's role in the revolution .. , he humorously answers, "I'm an old fashion when it comes to my understanding of politics and its relation to literature, since I mainly read history .. with the revolution we witnessed the emerge of streets/public arts but it needs to be documented. We need deep literature to capture details with insightful literary approach. Additionally, literature has to have space from any power like political and ideological. Literature has also to question everything," al-Muqri concludes. PS. Al-Muqri has recently published a new novel tittled, "Hurma" meaning a woman - published by Dar al-Saqi publishing house.